Personal portable lifts are gaining popularity among in-house maintenance & temporary construction applications for performing low-height operations. Due to technical advancements in machinery sectors, the low-level access platforms are being replaced by conventional ladders & scaffolding to achieve high safety levels. Several companies operating in the AWP market are developing new personal portable lifts offered as safe alternatives to the conventional ladders. For instance, in March 2017, JLG Industries, Inc. announced the launch of its low-level access solutions, LiftPod and EcoLift series. The engine-powered platforms are anticipated to grow at 8% CAGR from 2019 to 2025 attributed to the increasing utilization in the major application industries including construction, mining, and government. The AWP market customers operating in major regions including North America and Europe have utilized these machines due to high investment capabilities and the need to provide safe working conditions to the labors. The (mobile elevated work platform) MEWP market is also expanding due to low labor availability & high cost of existing labors in these regions. 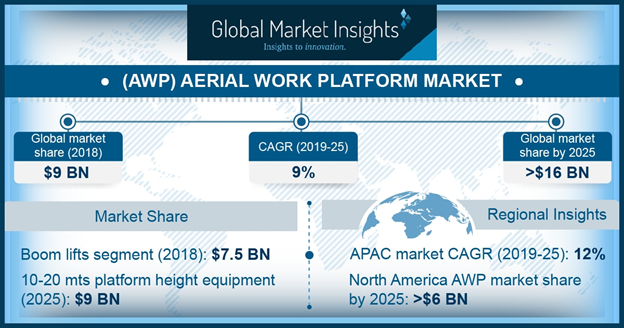 To reduce labor costs, achieve efficiency, and cut operational time, the application industries are deploying aerial work platforms, further developing the market. In the AWP market, construction & mining applications was valued at around USD 3 billion in 2018 and are increasingly deployed in complex building & general infrastructure projects across the globe. Government projects mainly deploy efficient machines & platforms to provide enhanced safety and reduce the load on human workers. The rising awareness in the South-East Asian countries and other developing countries related to machinery & time-saving benefits is further rising the requirement for technically-advanced platforms to address the construction sector demand. Countries including South Africa, India, and Japan are witnessing several infrastructure transformation activities that are expected to procure AWPs in huge amounts, further supporting the market growth prospects.